"This is a style of coney sauce that is found in the Greek restaurants and Coney Islands around the Detroit, Michigan area. It is very unique and different from New York coney sauce. 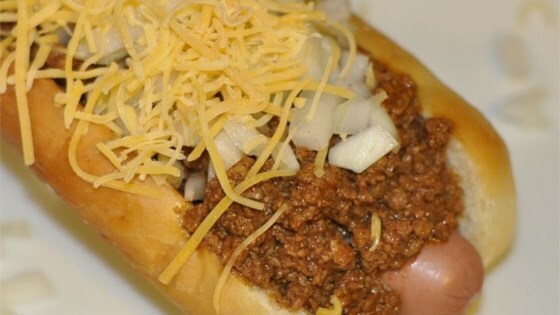 Serve over steamed hot dogs in steamed buns with mustard and chopped raw onion if you wish. " Combine the ground chuck, chili powder, cinnamon, paprika, pepper, onion powder, garlic powder, cumin, cayenne pepper, allspice, mustard, beef base, and 1 cup water in a large saucepan over medium-high heat; use a potato masher to break up the beef and mix the rest of the ingredients through the beef; bring to a simmer; reduce heat to medium-low and continue to simmer 2 to 3 hours, adding water occasionally to keep the mixture moist. Once the mixture is softened, stir in the crushed crackers to thicken. Thank you. Since we moved to Iowa, we have to wait for the big road trip to get a decent coney. Thanks for bringing Detroit back home to us. Go WINGS. Pretty good. I am here in TX and not quite accustomed to chili sauce like this one. I added a little salt and didnt do the beef base. Turned out really delicious. And GO WINGS!